Libel is essentially the written word being used in such a way as to defame a person (lower their reputation in the eyes of others). Slander has the same effect but with the spoken word. In recent times, where internet forums are concerned, the boundaries between libel and slander have become slightly blurred but they still exist as separate entities so far as the law operates for the time being. "16. When considered in the context of defamation law, therefore, communications of this kind are much more akin to slanders (this cause of action being nowadays relatively rare) than to the usual, more permanent kind of communications found in libel actions. People do not often take a "thread" and go through it as a whole like a newspaper article. They tend to read the remarks, make their own contributions if they feel inclined, and think no more about it." This kind of 'blurring' has been considered by the Libel Reform campaign report but I'll come to that in a moment. But if you participate on forums or even Twitter you might like to consider the ramifications of what you write more closely or at least consider that the Libel Reform campaign is one which you need to support if you value your freedom to participate in online exchanges. The primary defence is that what you wrote/said is the truth. 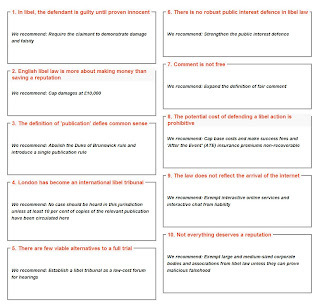 Under English law, it is the Defendant who has to prove that what they wrote is true. In effect this is a reversed burden of proof. 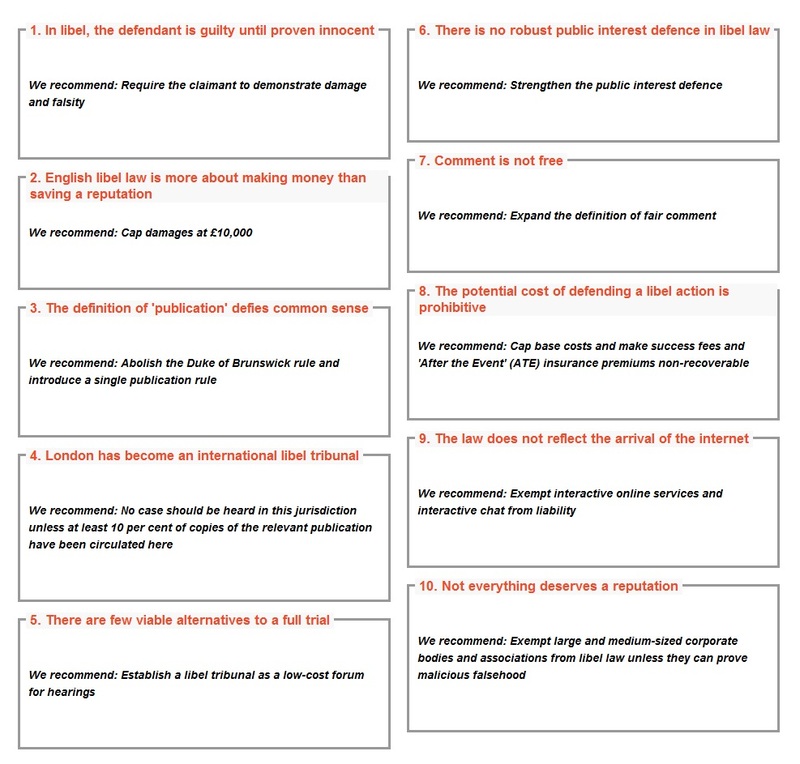 The presumption of innocence afforded to all person's in England is removed under the current libel system. You are, at all times, classed as guilty and the burden of proof is extremely high. So high in fact that you might as well give up in some cases because the costs involved in proving your case might outweigh the benefit of vindicating your own comments. The best example for this is Ben Goldacre who was sued by Mathias Rath. Even though Goldacre "won" his case, after the legal costs were chopped up he was out of pocket by £170,000 (well, his 'publisher' bore the brunt of the costs). Yep, read that again. £170k. Shocking. And Simon Singh, who I referenced in my last blog post, also stood up to what Dara O'Briain term "libel bullying"
It makes you wonder why people bother at all. But if it wasn't for people like Goldacre and Simon Singh we wouldn't have had the consciousness raising about UK libel that perhaps we have witnessed. "If we don't act we're at risk of becoming a global pariah. There are US States who view English libel law as so damaging to free speech they have passed laws to effectively block the decisions of English judges. Our report is an important milestone in modernising our antiquated and chilling approach to free expression." Person A sues Person B. Person A does not need to prove what was written was false or prove that there was any damage caused. Person B has to prove what they wrote is true. Person A sits back while Person B does the hard work but eventually proves their case. Person A is not equipped to pay Person B's legal costs probably in the tens of thousands. Person B therefore wins but is out of pocket, potentially ruined and there is no sanction on Person A whatsoever. This is the Goldacre case down to a tea but it is precisely the case that needs protection under the reform proposed. That said, it is still not quite enough for the law to operate on the basis that Person A proves their case because this can still create a significant cost burden for the parties involved with no guarantee of recovery. The Libel Reform campaign recognises this in their other suggestions. This is a positive suggestion but if Person C is maliciously libelled by Person D and causes a £1/2 million drop in turnover and Person D has had a significant stake in picking up the dropped business (i.e. gaining a financial advantage in damaging a competitors reputation) then a cap makes absolutely no sense at all. I think this needs some sort of rethink; I would recommend that Person C has to prove financial loss before the upper limit is considered. The Duke of Brunswick rule is 'multiple publication giving rise to multiple causes of action'. This has led to people being able to sue, from foreign jurisdictions, in the UK (also known as 'libel tourism') for even minimal publication where they allege they have a reputation. It's a Victorian Law and it needs to be updated to reflect the digital age. reason of why reform is needed in this area. I know of no real process that can be used as an alternative to a full trial save for the Defendant in a libel case taking the VERY risky step of attempting to 'strike out' the Claimant's case (also known as 'Summary Judgment'). It's risky because there is no guarantee of winning, the Claimant is given the upper hand in the application (or assumed to be right in what they have claimed and thus the burden of proof on the applicant is ridiculously high) and it is in no way cheap. In my libel case, I applied for Summary Judgment. Some have seen this as a very bold move indeed because of the risks. If you win, then this demonstrates that the case had no merit and there was no real prospect of a case succeeding. If you lose, it has the effect of showing that you have lots of hard work ahead of you to prove your words because the Claimant is assumed to be correct. What would help is a compulsory mediation or arbitration service where prospective parties can resolve some issues before taking the bigger step of High Court action. This needs to be compulsory because the advantages are still there for Claimants to take that step. Introducing a compulsory model ensures that the balance is restored on some level, reduce costs and more than likely resolve matters before the next stage. Judges will be clearer about what case they have to hear and many of the trivial bits of nonsense that tend to arise are usually committed to the dustbin. The recent issue highlighted by Willard Foxton was scandalous in that investigate journalism, a cornerstone of the free press and democracy, was roughshod over by the current libel system. Where there is a genuine public interest there needs to be a level of protection at the first stage. I recommend all to read his story and question how many times this might have happened over the course of the last decade at least. Lord Phillips said the defence of fair comment was "one of the most difficult areas of the law of defamation" - it was a law designed in the 19th century to protect critics from writing about art, books etc. Recently, as a result of Simon Singh making his valiant stand, the legacy of his own defence, and seemingly ratified by the Spiller vs Joseph case, is that where a comment is made it must refer to the set of facts upon which it is based. In Simon's case he did this by making reference to scientific evidence, or rather the lack of, but in any event he was a scientist criticising scientific claims with science (and with a great degree of incredulity). The Guardian reported that "The importance of the defence should not be underestimated - it is not only confined to the media, as indeed the facts of the case indicate. In the modern global electronic age, it applies to the blogosphere, phone-in programmes, letters pages, review sections, and editorials, all of which brim with comment on a wide variety of issues. It applies equally to the spoken and to the written word." Indeed, the evolution of a thread on the internet means we often see facts/pieces of information and opinions that might go unread by a person taking offence to later comments. Therefore some sort of law of "context" might also be useful but this can often, again, involve a protracted battle over the examination of the words complained of. Going a little further, I would like to see a generic protection be argued for people holding a professional title who are writing in their professional capacity. If Dr X is writing about a scientific study using his professional title then it is right for any complaint to be considered by his professional body rather than the expensive libel courts. Professionals like Simon Singh depend upon their reputation; if people like him write critically about a subject we are likely to think that he is writing about something in the public interest or in the interest of people in his field where if he was wrong he would rightly be called out by someone within the profession (or an interested amateur). If he was caught out writing about someone in a derogatory way (a libellous way even) without a care in the world then his professional reputation would suffer. Under the current libel laws Dr X would have to not only face an assault on his reputation but even if he vindicated himself he could be out of pocket by thousands of pounds. There has to be a better way. Hardeep Singh is still trying to recover tens of thousands in costs after winning his case. This situation involved a libel tourist and is why the current process is not fit for purpose. My only proposal, thinking quickly about it, would be for a plaintiff to pay a reasonable sum of costs, based on affordability, into the court to cover costs should an action fail on some level. Defendants need to be protected against spurious/vexatious claims. This is the most interesting campaign statement, in my opinion, because it goes to the heart of how we communicate ideas and thoughts with other like-minded individuals. Many of us who uses forums and comment areas tend to know how they function; it's akin to a live conversation and it tends to be fairly fluid but can quickly go off topic. A recent example was where I was discussing the death of Christopher Hitchens; the conversation started on how Hitch was misogynist and a warmongerer and evolved into an ad hominem attack on another commenter's position on abortion. No really took many of the insults that seriously. Why would they? It was, by and large, anonymous. There are very few people who use the same user name/ID for all of their accounts easily traceable to a single profile which reveals your name. I am one of those people who uses the same generic username, other than my real name, ("vjohn82"). I think I used "UKfingerpicker" on a guitar forum because they didn't allow numbers in a name (not sure why) but other than that, I'm pretty honest about my intentions, beliefs and comfortable with being open about who I am. I have been criticised for this and even told to protect myself. I see no plausible reason to do this at this time. Perhaps in light of being sued for libel, it might be that warning shot over my bow to protect myself. But as readers will know, I was pretty much anonymous anyway and I offered my information freely because I stand by my words. The Smith vs ADVFN case above represents a good starting position for this particular campaign point. However, this is not to say that people cannot be libelled, it's just that the level of damages involved with the readership considerations and the audience would surely invoke the Jameel argument on some level and thus be a waste of time. Should any allegations reach a certain level of seriousness, the High Court and all of the associated expense is disproportionate to the amount of damage ever caused (if any). So while I think it is interesting to say that all online interactions should be exempt, I think this should only apply in placing the action in the right arena for vindication. For example, there are three separate claims processes available in the County Court; the Small Claims Track, the Multi Track and Fast Track. Depending on the value of compensation sought the case will be allocated to a track via a proposal from the parties (via an Allocation Questionnaire) and with the final word from the Judge hearing the matter. A similar process could be used in libel cases with only the most serious cases being sent to the High Court. This is pretty much the current situation which exists for county councils and other public bodies; is there a good reason for a large/medium company to need protection from defamation unless the person/company allegedly libelling them was gaining financially? I would also argue there is little reason for any company to sue for damages unless there was a financial motivation for a person/company doing the alleged libelling. The burden of proof should be on the company arguing that they have been defamed. If not, they should issue a statement acting as a right of reply. They may do this through a solicitor of course, to give the statement more weight perhaps, but can a hugely expensive trial produce a satisfactory outcome when it dawns that the money spent could have been used on much more worthwhile endeavours? My own libel defence is not over yet so I might well have a different opinion on what further proposals I would like to see put forward. Conversely, I could also change my opinion on some of the above issues depending on the outcome. There really is so much to consider which is why people should inform themselves as much as possible about Libel Reform and freedom of speech in general. It is not about saying what you want and getting away with it! It is about a fair and proper process for all parties concerned and to place libel proceedings in the correct context considering the development of the internet which has changed both how people communicate and obtain information. The current libel laws do not reflect this development which is a major reason why Libel Reform exists. "Beware the irrational, however seductive. Shun the 'transcendent' and all who invite you to subordinate or annihilate yourself. Distrust compassion; prefer dignity for yourself and others. Don't be afraid to be thought arrogant or selfish. Picture all experts as if they were mammals. Never be a spectator of unfairness or stupidity. Seek out argument and disputation for their own sake; the grave will supply plenty of time for silence. Suspect your own motives, and all excuses. Do not live for others any more than you would expect others to live for you."